Some sites require venturing under the sea to witness the magic that happens when you combine art, beauty and nature, then add water. And if you’re brave enough to sink into the deep blue depths of the ocean, you might be greeted by fascinating sunken treasures. Well that can be said about each of the following underwater explorations. From a Caribbean paradise to life-sized statues, they promise to be a swim you will never forget. Flaunting a coral-infused rustic coat, the Vaersenbaai Car Piles is a dive into the '40s and '50s as classic cars along with cranes are laid to rest in peace on the floor of Curacao’s Marina Park. Submerged about 90 feet below the surface, a 25-minute swim is required to get up close to the hot rods that are well worth the visit. Not many vehicles are sentenced to a watery journey, but when they do it is an extraordinary sight. Try sitting behind the wheel of one of these bad boys and you too may become a cool underwater feature. Imagine diving through the hollow blue depths of a large reef and suddenly feeling the silent stares of hundreds of stone-face statues. Buried in the National Marine Park of Cancun, Isla Mujeres, and Punta Nizuc, the underwater site is a masterpiece of over 400 sculptures representing Mexican locals created by British sculptor Jason deCaires Taylor. Dubbed “The Silent Evolution,” the attraction is also the first installment to Mexico’s underwater museum called Museo Subacuático de Arte (MUSA). By combing art and nature, the artist used eco-friendly material that not only preserve marine line, but create an awesome diving experience to the hundreds of thousands of swimmers “The Silent Evolution” annually attracts. Some may deem this sunken city haunted, but if you’re willing to venture as low as 40 feet to see what was once the “most wicked and sinful place in the world,” you may need to say a little prayer first. 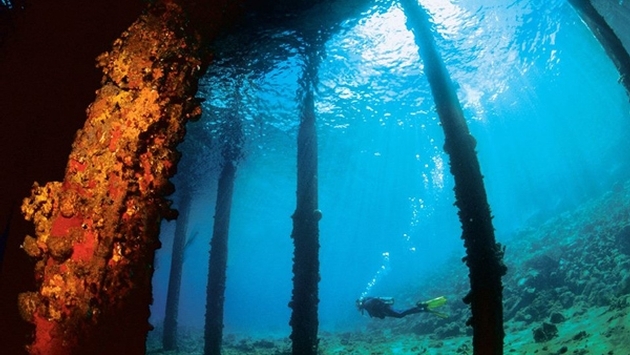 After all, not many dives require permission from the government, and judging by Port Royal’s ill-fated history it’s easy to see why. Port Royal was once a destination dominated by rum, prostitutes and pirates. However, more than 30 acres of its landscape was sentenced to a life submerged in the Kinston Harbor when a 1762 earthquake violently opened the foundation of the city up. Whether it was a twist of fate or a demonstration of Mother Nature’s weird sense of humor, the sunken city remains the only one of its kind found in the New World. Have you ever thought about how you wanted to be buried? Well, if you’re an admirer of the sea the Neptune Memorial Reef might just be where you’d want to spend your days in the afterlife. Located 40 feet below the waves, a few miles east of Key Biscayne in the vibrant city of Miami, a mausoleum decked out with a lion keeper gate, road column, an entrance lion and welcome center feature welcome the cremated souls of the deceased. Quick dives and boat tours are available for visitors wanting to pay their respect to their loved ones or explore this underwater home of the dead. As the largest manmade reef in the world, The Neptune Memorial Reef definitely puts a twisted spin on the phrase sleeping with the fishes. Grenada’s Underwater Park is known for its many sunken treasures, but none of them speaks volume like Vicissitudes. Once again, sculptor Jason deCairnes Taylor has created an ecological masterpiece, but this time in the shores of Grenada. Vicissitudes is a depiction of children holding hands in a circle, and by connecting the statues together they are able to withstand the currents of the water, yet convey deeper meanings of “continuum and unity” through the eyes of the adolescent.